Incoming transmission! “There’s even more of them captain! We thought we were finished, but they’ve only just unleashed even more of the damned things upon us! Many of these wretched hell things feel even stronger than the last ones we fought! We can’t hold out for mu-” Transmission ended! Author’s Note: Sorry for being late on this one. I found out last minute that my group wanted to postpone my game, so I would have had a game synopsis last week. I also got very sick following a busy work week. With that, here’s a handful of more DOOM monsters. I might do an update later on with another popular monster in mind… Arachnotron… Mancubus… Something like that! Between running out of energy from work during Easter and Passover holiday hours and a whole bunch of other things, next post will be a tad late. Sorry about that. At long last, the players are ready to embark into the mountains ahead, unsure of what strange things await them within the jagged lands beyond. What dangers will they face? Will their ranks thin? Will some go mad? Will they awaken new horrors upon the land? Only time will tell! Author’s Note: Due to a handful of things, part 2 was cut very short. As such, I decided to merge the recap with part 3. Stay tuned for more after the jump! Memes. They’re garbage. But, we love them… for some reason. Sometimes such ideas spread so fast, as per the theory that named them, that they reach other planes. Such planar scholars witness these cross-dimensional ideas and sculpt them into something else entirely. And thus, new spells are created from what started as a simple idea! These mad sages have provided four of their latest creations. Author’s Note: Sure, I’ve done stuff like this in the past… But, why did I do this? Also, these spells are likely unbalanced, as they were made as spur of the moment jokes. (April Fools!) The Next Plotline for D&D 5th Edition! I know what day it is and it’s not the right day to be gullible. Also, I know this blog is about homebrew and the occasional related topic. That said, since this blog was started, I have made posts about how I fanboy at the idea of Science-Fantasy D&D! Seriously, do a search, more than half of the posts on this blog are science-fantasy related! Hell, I made my own adventure that I’ve also been recording for the D&D podcast I’m on (called FlumphCast, look us up! We play D&D very drunkily!) But, I digress. Wizards of the Coast has earned my love back. How, you may ask? Through their next plot based adventure, of course! So, breaking tradition a little, I wanna ramble about Wizards of the Coast’s next big announcement for the Fall 2017 super adventure! And by future, I mean indeed a Science Fantasy adventure! And not just any is a source of inspiration, one of the greatest classics is! I’m talking about Expedition to Barrier Peaks! I mean, come on, they teased a chunk of it in Volo’s Guide to Monsters! Many saw it coming! It was likely cut from Tales of the Yawning Portal due to space, but it’s being fleshed out! The hints here and there likely imply an alien invasion stemming from a crashed ship in what I can only guess will be either Icewind Dale or the Bloodstone regions. On top of that, many tiers of play will involve the Xeno Threat as it brings chaos to parts of the Realms. What’s this, Doc? You’re ranting about Realms-Shattering Events and misuse of lore? And here you are celebrating a literal alien invasion of the setting? HAVE YOU GONE MAD? Well, kinda. I dunno, I just love this idea in any capacity and D&D doesn’t do it often enough… especially in recent years. So, this is one instance that I’m willing to let this sort of things slide. 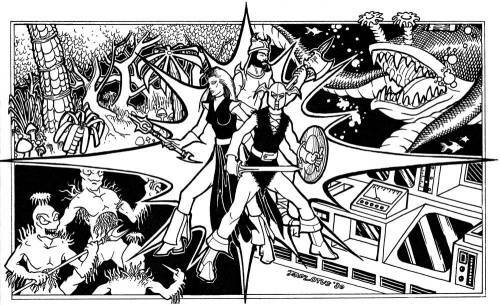 Plus, just look at the name of the event, “The Assault of Radiant Steel!” It sounds more like a prog-rock song than a D&D adventure, but I don’t care! That makes me love it even more! Read onward for more information, including launch info! WOOOOOO!